While most of the country is praying for spring, here in Los Angeles, we are going through a heat wave coupled with the violently dry Santa Ana winds which have been gusting up to 100 mph. The wildfire season has officially started and it’s being exacerbated by the fact that we’re in a drought. All of this to say, it certainly feels like summer here! So, in an attempt to beat the heat and welcome this weather with open arms, we decided to fire up the grill and what was born was a delicious and simple summer salad! Enjoy! Fire up the grill and allow it to get hot. Meanwhile, lightly coat the Yellowfin Tuna steaks with a drizzle of sesame oil, salt and pepper. Chop the green onions, grape tomatoes, cilantro and peel and slice one of the oranges. In a measuring cup, combine the dressing ingredients with a whisk. Place the tuna steaks on the grill for 5 minutes, then flip and cook for another 5 minutes. In a large serving bowl, pile up a huge helping of fresh spinach, sprinkle the green onions, grape tomatoes, orange slices and cilantro, then toss it lightly with the dressing. 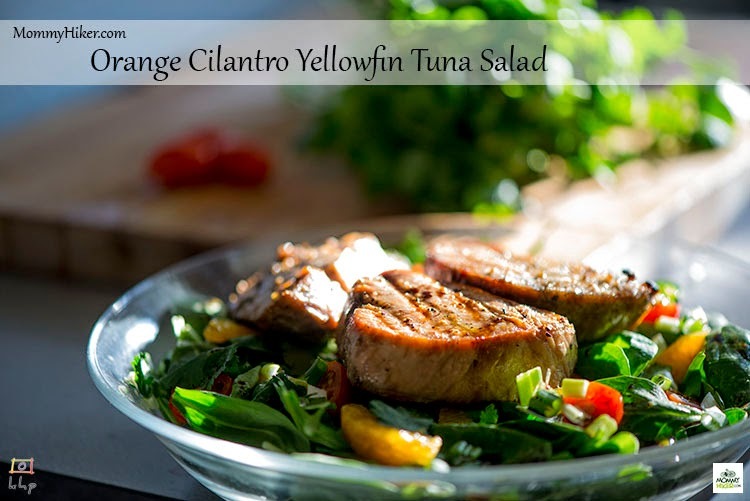 Arrange the tuna steaks atop the salad and dig in! I served this with my favorite summertime side dish, Cacık, a cold yogurt and cucumber soup! Enjoy! This looks absolutely amazing! Definitely will be trying this recipe in future. Thanks for the post! This looks like a perfect way to beat the heat!